It's still doing it. I have no idea why, in some places, the scenic glue is drying white. I have used thinned Elmers, Elmer's school glue, Mod Podge, and this time Future (well, Pledge Floor Care Finish) which is clear to start with. It doesn't do this anywhere else that I'm trying this except my layout. It's driving me crazy, because the areas where it doesn't happen look great. The milky white reminds me of when lacquer is sprayed painted on a humid day with a fast drying thinner mixed with the color. This causes the paint surface to flash off quickly trapping moisture underneath resulting in a milky look. I don't know what you are trying to do here, ballast? Are you using alcohol as a thinner? Is the surface drying to fast or are you trying to force dry it? Are there any paints like Dullcoat or glues underneath that may cause a reaction? Ballast and ground cover. I have tried several techniques over the last year, and they've worked everywhere except here. In this case the track is glued down by Aleene's Tacky Glue. Roadbed is glued with yellow wood glue. There are also some foam pieces that are glued with more Aleene's. Track is spray-painted with Rustoleum camouflage. I'm using real dirt, a little charcoal grout, and Scenic Express stone ballast. At this point I'm applying Future right out the bottle with a pipette and letting it dry naturally. The last time I did it I used Elmer's school glue if I recall, mixed with alcohol. That's what I was using on Harvey's layout and never had this problem. Tonight I tried rewetting a small section with more Future and also added another layer to a different section to see if that will help (I've been applying the ground cover in layers anyway). I also experimented with simply coloring it with Pan Pastels to see if that would work. Since then I've been watching glue dry. Looks OK for the moment. Before I went down tonight there was one tiny section that dried white. But this time is was a couple of larger sections. My plan to try to prevent it is to work in smaller sections at a time, and also to use as little Future as possible. If I get a chance I make pick up some Matte Medium and use that instead. 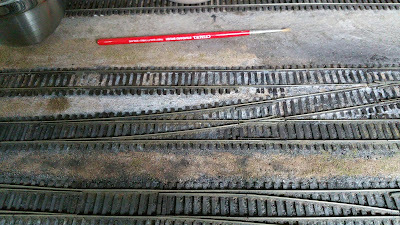 While the gloss finish of the Future is a non-issue on the ground cover (it doesn't dry glossy at all), it is a problem where it gets on a tie or the side of the rail, because the gloss finish won't take the Pan Pastels which I've been using as my primary track weathering medium. I have some matte clear pastel fixative that I've used which works really well to provide some tooth, but it's an extra step I can probably avoid with the Matte Medium. My best guess as to the problem is my basement environment. Eventually I'll be installing a new HVAC zone for the basement, but it's complicated and I haven't decided how I'm going to do that just yet. So in the meantime I've got to figure out what's going to work now. Sounds like you have a lot of different things going on at one time! I would not apply any more glues/Future at all. My experience with problems like this is if you have a problem underneath a surface putting more like materials on top of it will just compound the problem. Two things I would try first. I would try thoroughly wetting a small area that has the problem with alcohol only, if it is a moisture problem doing that may release the trapped moisture and bring it to the surface to dry. Second I might try heating a small area with heat lamp or hair drier, that may help but I doubt it. Using real dirt may be a problem, it could be holding the moisture from the glues. I don't know about Aleen's Tacky Glue I have never used it to hold down track, but I doubt that is a problem. Starting all over would be best but I know you can't do that! 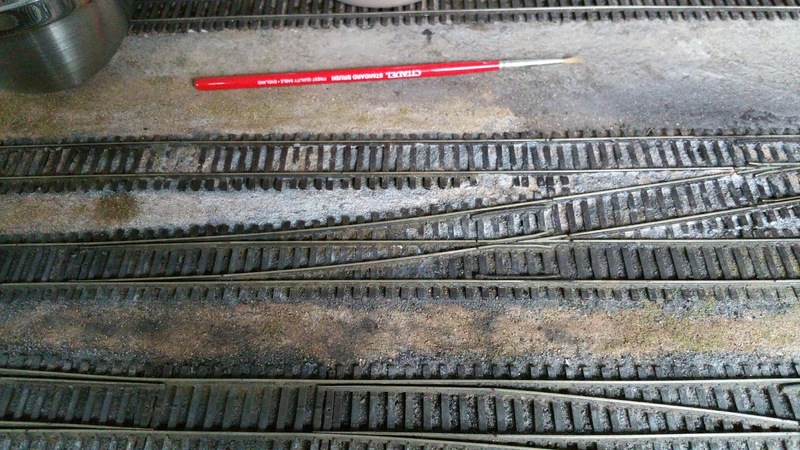 You could seal the problem area with track in place and reapply scenic materials if you have to. To seal the area I would make sure everything is DRY, vacuum or scrape up any loose materials or powders, then seal everything in the problem area with a solvent based spray paint like the Rust-oleum camo letting it thoroughly dry, then you should have a hard clean surface to start over. Try using matte medium from Scenic Express diluted 4:1 with distilled water as an fixative for your ballast and varying dilution ratios for other scenery materials. I always use alcohol as a wetting agent before applying the matte medium solution to ballast and scenic materials. I have never had a problem with the matte medium for a scenery cement and will stick to it. I do use brushed on full strength school glue as a base fixative to apply static grass, that works very well for that. Maybe you could pick up a de-humidifier for downstairs if moisture is the issue. Good luck, call if I can help.